Gold Bond Ultimate Eczema Relief Skin Therapy Cream: I nabbed this from my mom's bathroom when I was home last Christmas and my legs were dry and itchy. It immediately soothed my legs leaving my skin soft and hydrated for the entire day. I was impressed and now I use it everyday after I shower and before going out in tights. It's a great alternative to another one of my favorite (pricier) Winter creams, First Aid Beauty's Ultra Repair Cream. Neutrogena T-Gel Therapeutic Shampoo: The only flakes I encounter this season should come from the sky, not my head onto my favorite black cashmere. It's an unpleasant side effect of winter for me, but I know I'm not the only one. This shampoo pretty much takes care of the issue. Amika Nourishing Hair Mask: T-Gel Shampoo doesn't smell very pleasant, so I like to follow it up with this beautifully scented deep conditioner from Amika. You can leave it on for as little or as long as desired, depending on how much love your hair needs. Even just a minute with this mask leaves my hair feeling soft, moisturized, and clean. Supergoop! Rise & Shine Beauty Set: This set (available exclusively at Sephora) includes Supergoop! 's new City Serum with SPF 30, Eye Cream with SPF 37 and two shades of their CC Cream with SPF 40 (not pictured). Wearing SPF in the winter is just as important as summer and this thicker serum and eye cream are great for simultaneously hydrating and protecting the skin. I use it every morning before moisturizer and primer. Vichy Idealia Life Serum & Eye Contour Idealizer: This serum is also heavier than other water or oil based serums making it my ideal night serum and eye cream. These two products are uniquely formulated to repair the skin, keeping my skin looking bright and maintaining a healthy appearance. 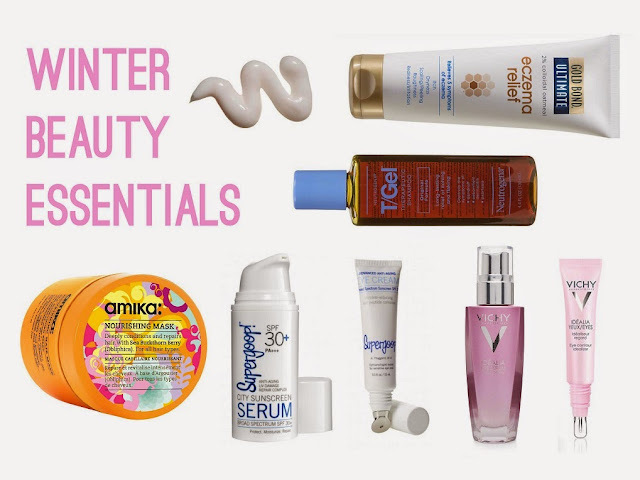 What beauty products you swear by during these cooler months? Do you have any seasonal favorites?